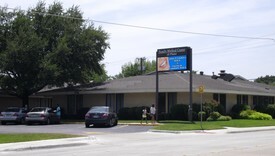 Located in the Family Medical Center of Plano at the corner of Ave N and 14th Street in East Plano. Office Hours: Closed Monday, Open Tuesday thru Fridays 8:30 a.m. to 5:00 p.m.
We request a 48 hour notice for any changes or cancellations so we may accommodate another patient. We are committed to providing quality and affordable dental care. You have multiple options for payment. For your convenience we accept cash, check, MasterCard, Visa, Discover. Low or No interest payment options are available through CareCredit or LendingClub. For your convenience you can access our New Patient forms here. We would love to hear from you! Please feel free to contact us with any questions or comments you may have by calling our office or sending an email. Everyone was so nice, friendly and outgoing. I just love them!!! !They are exceptional folks. They are professional and do their jobs very well. And Dr. Crandall is the best dentist of all!!!! As usual, my six month check up was quick and easy. I have confidence that Dr. Crandall and his staff are taking good care of my oral health! !